Day to day Facebook going to give you to share more and more on Facebook - so it's main object to out a new feature or option designed to do something new. The social networks thought is video is the best answer to all its users. Present day the Facebook Live Video and video seem to be helping. People are do not seen the post text statuses about what's in their mind, but the videos are very easy to interact the persons or friends. 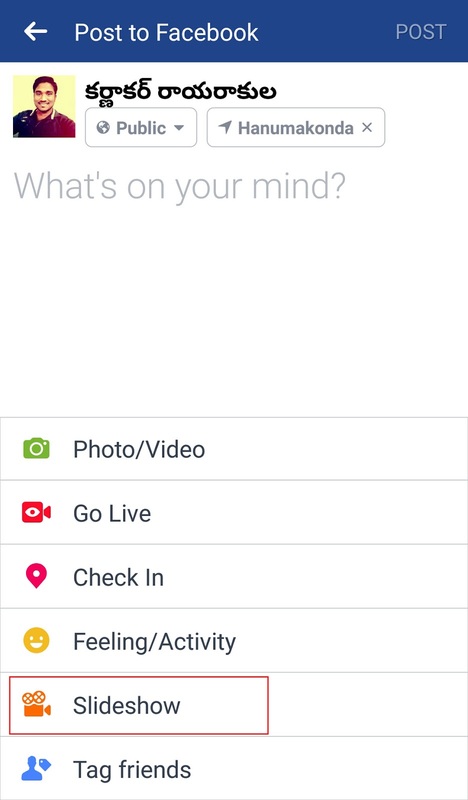 Facebook is now pushing an automatic quick video-maker feature called as Slideshow. 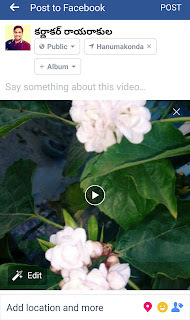 Facebook Slideshow: What is it? 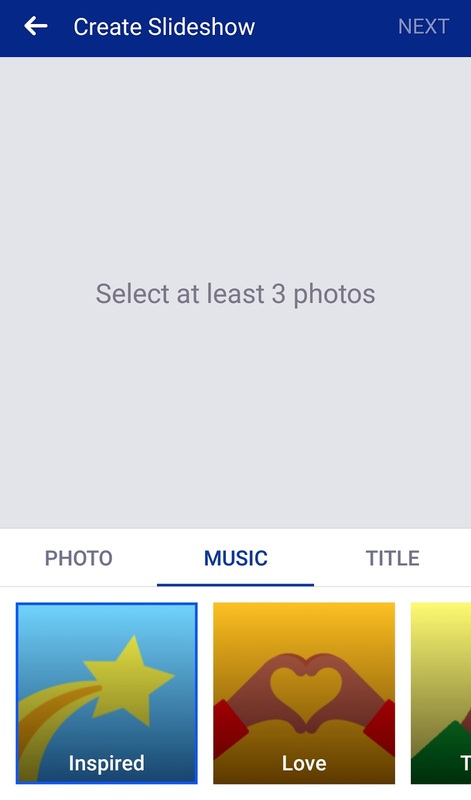 Sharing videos and pics most important part of Facebook. 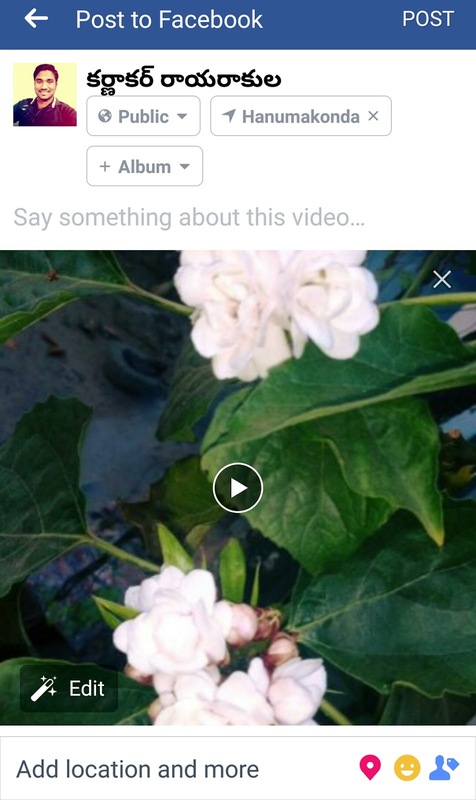 Facebook is giving a new feature called as Slideshow.. 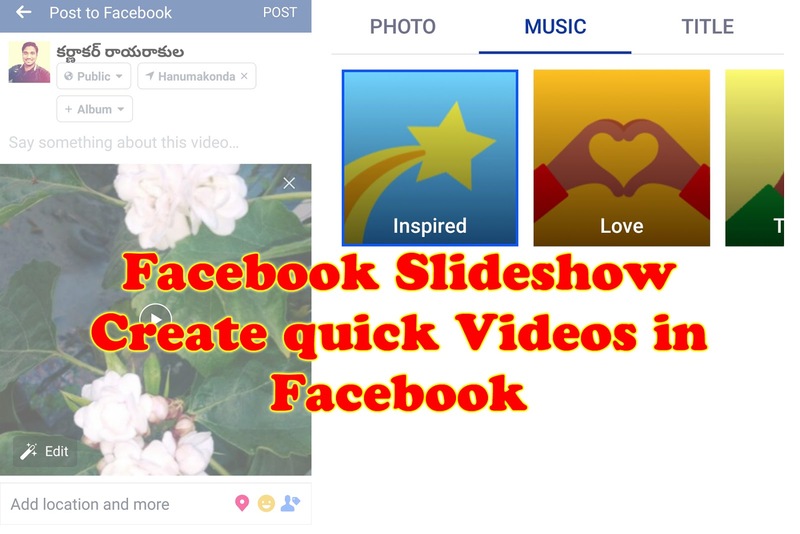 It is an easy way to create and share the slideshows (videos). Facebook Slideshow: How to Create? 1. 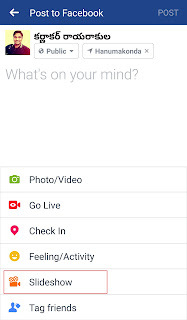 Open the Latest Updated Facebook application. 3. Now you can see the slide show option like this picture showing. tap Slideshow feature in Facebook. 4. Now a screen will open which have 3 option i.e. Photos , Music, Title. 5. Browse and Select some photos to create slideshow, and There are presently 16 Music themes are available choose from, including Inspired, Love, Thankful, Adventurous, Joyful, Amped, Nostalgic, Happy, Snazzy, Playful, Optimistic, Dramatic, Soulful, Epic, Heroic, Mellow. More Music themes will be added later. 6. The last one but not least The Title Create a title for the what purpose the video is going on for eg. A recent weekend tour to goa. Then you can give a title for Goa Trip or weekend trip like this. 7. 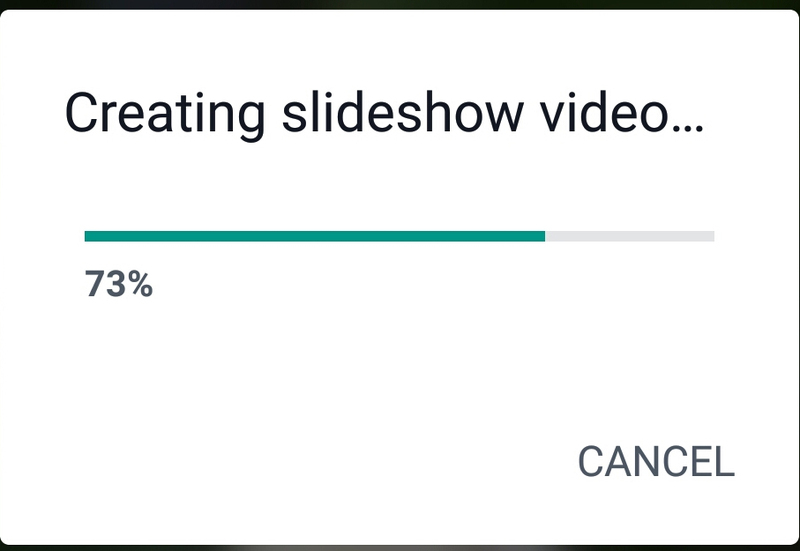 Once your editing is done, hit the Next button at the top and write something about video in the post and share your slideshow to your News Feed. 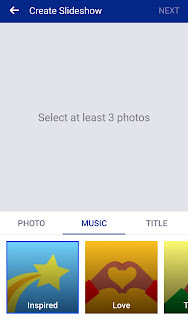 Note: If you don not see a Slideshow option in the Facebook Application, then Update your Facebook application to Latest or try finding a friend's slideshow "Try It".